Hi all! 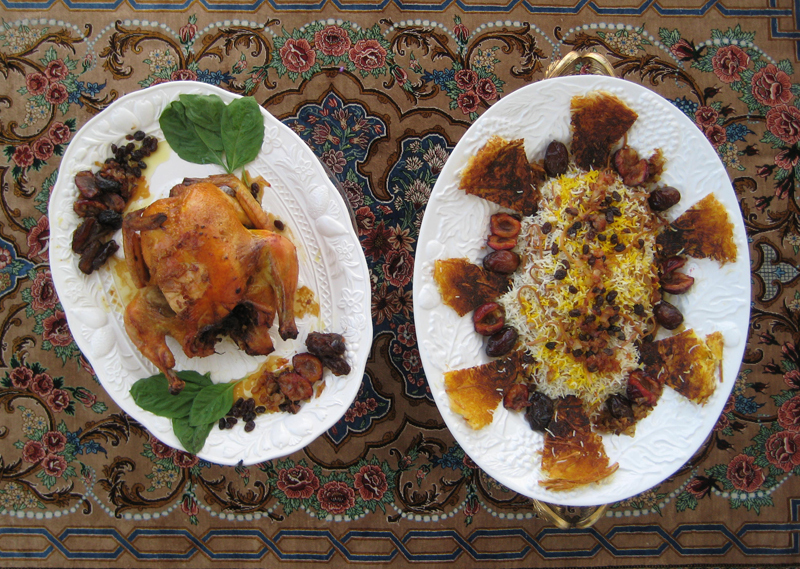 Let me kick start this festive post by saying that it is part of an effort by a whole gang (a veritable tribe) of us Persian food scribblers who gathered together to bring you a roundup of recipes in honor and celebration of Mehregan. Please scroll all the way to the end to see the index link to all these wonderful writers’ delicious posts: a lovely bounty in honor of a festival of love and bounty! What is Mehregan? 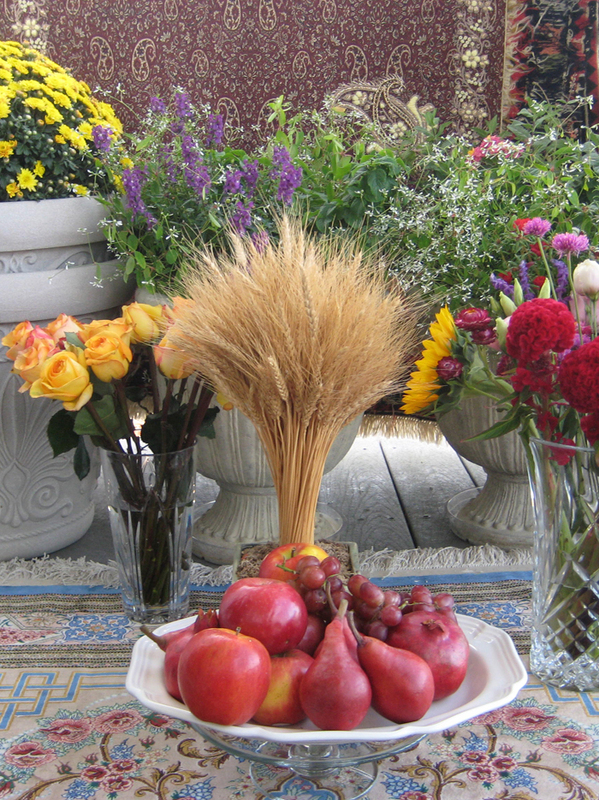 Dating back to 6000 years ago, Mehregan is an ancient Persian thanksgiving celebration of harvest and bounty — also referred to as Festival of fall, as it marks the harvesting season and is a tribute to nature. The word ‘mehr’ in Farsi means affection, kindness, love. It is also the name of the seventh month (coinciding with the zodiac sign of Libra) in the Persian calendar, dedicated to Mehr: the Zoroastrian Goddess of Light, Knowledge, and Love. In the interest of full disclosure, I need tell you that Mehregan is no longer widely celebrated in modern Iran, except in a few cities such as Yazd and Kerman where there still reside a considerable Zoroastrian population, which was the religion of ancient Persia. But at one point in the history of Iran, Mehregan was as important a festival as Norooz, the Persian New Year. In ancient Persia, the year was divided into two seasons: summer and winter. Norooz heralded the beginning of summer and Mehregan heralded the beginning of winter. Each festival was a major celebration and ancient Persian kings gave two audiences a year: one at Norooz and one at Mehregan. A perfect and harmonious symmetry. 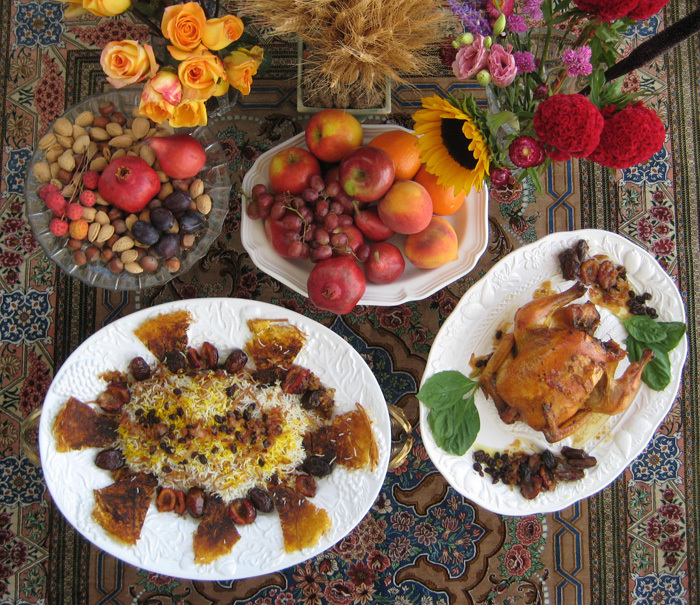 The two festivals share many rituals and symbolism in common, including: wearing new clothes; thoroughly cleaning one’s home; preparing a feast and celebrating with friends and family; setting a decorative and symbolic table with things like sweets, nuts, water, mirror, various grains for prosperity (such as wheat), fruits (specially pomegranates and apples), flowers, wine, coins (similar to haft seen) and burning candles and wild rue. It’s funny how some of this knowledge may not be conscious but runs in one’s blood! A good few weeks ago I was minding my own business when all of a sudden I had a deep yearning – practically a physical craving – for a thorough spring cleaning. I wanted to khoneh takooni, which as you may remember means ‘shaking the house’ and refers to the vigorous spring cleaning that is one of the cornerstone traditions of the Persian New Year. It struck me as funny then to have this unseasonal instinct for spring cleaning with fall approaching and I even tweeted about it. (Because remember: if you don’t tweet or Instagram it, it did NOT happen!) And it was only when researching Mehregan for this post that I realized that my seemingly uncalled-for craving for a spring type of khone takooni was merely the ringing bell of ancient memory and instincts! Now what kind of food does a Persian food blogger make in honor of Mehregan? Well, I once again invite you to explore the index link at the very end of this post to see the wealth of offerings. As for yours truly, since Mehregan is a festival of Thanksgiving, I chose the stuffed chicken as an homage to the stuffed turkey at the table of American Thanksgiving feast. As for reshteh polo, I chose it for two reasons. One is a nod to the meaning of ‘mehr’ which as I mentioned means love and affection and so I wanted to make something that I love and have much affection for and that is … carbohydrates! 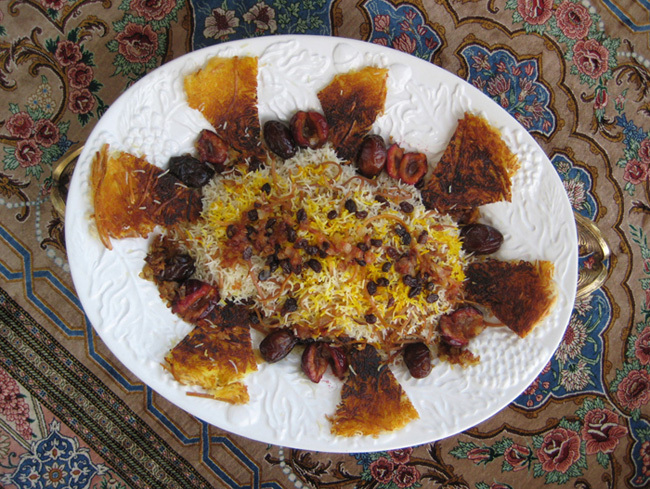 Thus: reshteh polo – a type of Persian rice made with noodles! Because if Persian rice on its own is not awesome enough, imagine it embellished with soft noodles and punctuated with the bewitching taste and texture of dates and raisins sauteed in caramelized onions. Oh, have mercy! A heavenly carb-load! The other less gluttonous reason is that reshteh is the Persian word for thread and in a pun, it also means clue, and as such, Persian noodle rice is one of the dishes served for the Persian New Year in that it symbolizes one having a grasp on the threads of their life! A delicious way of saying: Get a clue! I used a mixture of 1/2 cup prunes, caramelized onions and 1/4 cup crushed walnuts. Please feel free to substitute whatever is pleasing to you. In a big skillet (a wok type of skillet would work best) heat 4 tablespoons of oil till sizzling. Add chopped onions, sprinkle with some salt, lower heat to medium to medium high, and sautee onions till golden. Usually takes around 10 minutes. During this time, stir onions as needed but not too frequently (otherwise they will release liquid instead of getting golden and crispy.) Once onion is golden and translucent, add the pitted dates, raisins and prunes. Sprinkle with a touch of cinnamon and sautee for a minute or two. Sort out prunes with some of the onion separately and set aside to use for the stuffing. Sort out dates and raisins and the rest of the onion and set aside to use with the rice. Clean and wash rice until the water runs clear. Soak rice in cold water for two hours or overnight. (See detailed instructions for cleaning and soaking Persian rice here.) Drain rice just before adding to the boiling water in step #3. Break off the long noodle strands (taking a bunch in hand at times) in half and then break each bunch in half again. Ending up with approximately 2″ to 2 1/2″ long noodle strands. Drain rice in colander and rinse with tepid water. Set the drained rice in the colander aside. Meanwhile, rinse the pot used to boil the rice. Then add 1/2 cup olive oil and 1/4 cup water to the pot. In a medium sized bowl mix 4 tablespoons of yogurt with a pinch of saffron. Take a few spatulas of the drained rice and mix with the yogurt. (But don’t smoosh the rice.) Evenly line the bottom of the pot with this rice and yogurt mixture. (This mixture will become your tadig, bottom of the pot crunchy crust.) Place a few spatulas of rice over this. Then add some of the dates and raisins and golden onion mixture prepared earlier. Repeat this layering process and when done, arrange the rice into the form of a pyramid. Sprinkle the top of the rice with some ground saffron and cinnamon. Using the end of the spatula, make a few wells in the rice. Cover pot with a lid and cook rice for 10 minutes over high heat. Then reduce heat to medium and cook for an additional 45 minutes. Wet a cloth and set over the counter. Once rice is done, remove pot (w/out removing the lid) and place over the wet cloth and allow to rest for 5 minutes. When ready to serve the rice, take a couple of spatulas (of the saffron and cinnamon sprinkled) top of the rice and set aside for garnishing. Place the rest of the rice in a serving dish, shaped into the form of a dome and top it with the saffron and cinnamon set-aside portion of rice. (Optional but delicious: pour 2-4 tablespoons of either olive oil or melted butter over the rice.) Next, detach the the ta’dig (crunchy crust at the bottom of the pot) and cut into wedges and serve with the rice in the same serving dish or separately in another plate on its own. Enjoy alongside with the roasted chicken. Make it. Enjoy it. And noosh’e jaan! And finally, here’s the index link file to the recipes of the glorious bounty of Persian yummies and goodies for Mehregan. It’s been a pleasure to be part of this group and I want to try everyone’s recipes! That picture is like a painting, a true Still Life. Just gorgeous. I love your beautiful sofreh and everything about this post. We really have brought Mehregan back to life! oh muh gahd this looks so good! you are like a arteeest or something? so impressive. Such a happy and festive post: BEAUTIFUL pictures. Happy Mehregan! It’s a little bit rich for lunch – it may put you in mind of a nice nap – but if you lived nearby I would have been happily persuaded to make a batch just for you! Azita what a beautiful feast you have created. NousheJan ! What a wonderful feast! Thanks for letting us have a glimpse at all these wonderful delicacies! At the risk of sounding corny, it truly is my pleasure and thank you for such a lovely comment. Happy Mehregan Fariba joon! I’ve had a running around day and can’t wait to check out yours and everyone’s recipes. I’m so happy you liked mine. Yummmmm! Azita Joon, I’d gladly have this meal for ANY type of thanksgiving! I’ve only ever had reshteh polo at an Armenian restaurant and I thought to myself, “Of course! Why in the world not?” The pasta with the rice just works. And what a tasty looking bird too! What a feast! You set such a lovely table, Azita joon. Everything looks so inviting! such an inviting spread! no doubt you are an incredibly gracious hostess! Mersi Tannaz joon, I do love dinner parties,that’s true! You should be very proud of your table.. someone told you that it looks like a painting… it’s true! It give you the warmth we’re supposed to have during this kind of celebration! Thanks for sharing Azita! Means a lot coming from you! Thank you! Thank you! You should try the rice with noodle, that’s all I’m saying! I know you’ll like it! Gosh you are so talented! (gush gush gush). We never did whole birds in our house very often for whatever reason but I think I need to start the tradition in my little ghootee. As ever, beautiful story telling and the photos just bring it all to live. Beautiful! You should frame that top photo. Seriously! Awww, thank you chef mimi! Mehregan sounds like a wonderful celebration! So lovely that you and so many other blogging friends have brought it to life. Your dishes look fit for royalty dear Azita – absolutely scrumptious! The food presentation is absolutely beautiful ! Dear Azita, what a lovely dish and what a lovely post! I love your sense of humor and joy. I too feel some things are just in our blood and can’t be helped. Like gathering around a cozy table and celebrating the changing of the seasons with loved ones! This looks like a decent feast for the palate, and the eye as well! Dearest Laura! I miss visiting your beautiful blog. I can’t wait to come and see what you’ve been up to and meanwhile thank you for the lovely comment and I’m always so very happy to hear from you! OMG. These photos are so fabulous & delicious. I had dinner but the minute I grazed over this page of your blog I felt starving. I’ve never made reshteh-polo & now I MUST. It is such an Autumn looking feast & reminds me of how much I love & miss this season. What a beautiful feast Azita joon. Lovely! I will be back later to explore your list of links…they look so interesting. In Finland, a thourough cleaning of the house and a celebration is held twice a year as well. Once at Christmas and once at midsummer’s or St. John’s . The rule of thumb that most people follow here is that the sauna is washed thoroughly for both of those occassions. Such an interesting post, thanks for sharing. Azita jan, “you’ve done us proud” as the say in good old Blighty. I love your sorfeh it is so inviting and as for your nod to thanks giving and carb on carb fest, well, what more could a girl want on a dreary autumn day? BTW, I must have been in earshot of the ancient call to clean as I too have been sprucing up the place! Merci. You heard the call too? I’m telling you, it’s in our blood! Isn’t that interesting? Mersi for lovely things you said and mersi for coming over and visiting and saying them. Boos boos boos! Thank you dear Fae! So good to see your smiley face again and welcome back!! with your presentation but I to find this topic to be atually one thing which I believe I might by no means understand. It sort of feels too complicated and extremely vaset for me. I am looking forward in your subsequent submit, I will try to get the hold of it!